It emerged earlier this week that the usually financially hand-cuffed Premier League club Newcastle United were set to bid £20m for a striker. The name of the player was a mystery until the cat was out the bag late Tuesday night. The Dutch press received a leak from Feyenoord that the player in question was indeed Danish international Nicolai Jørgensen writes Will Burns. 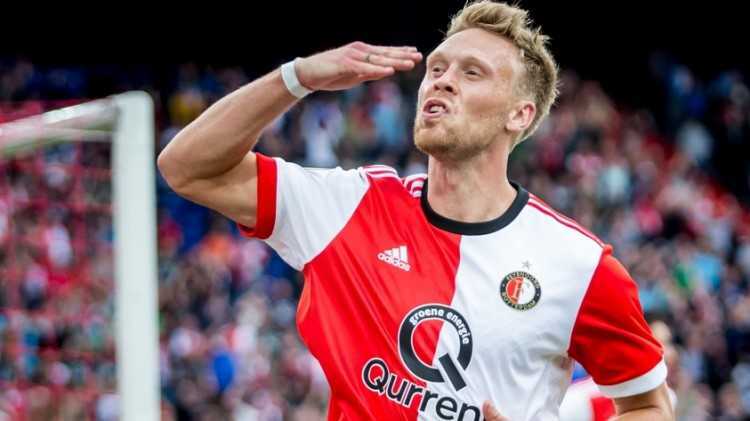 Last year’s Eredivisie top scorer with a 21 goals, Jørgensen has been valued by Martin van Geel, Feyenoord’s sporting director at £20m, but Newcastle have made a bid nowhere near that valuation as time of writing. Now the Rotterdammers may well be playing financial hard ball, it’s understandable why. While rivals Ajax and PSV are profiting well from England’s megabucks (selling stars consistently to the Premier League), Feyenoord’s income is set to heavily diminish next term due to the incredibly likely failure to qualify for the Champions League next season. Currently sitting in fifth on 33 points, Feyenoord are 16 points behind current league leaders PSV. Meanwhile, taking a lower offer for the Dane may be an option after bringing club legend Robin van Persie home this past week. Although the 34-year-old will be taking a pay cut from times past, he will still make a dent in the profit margins. 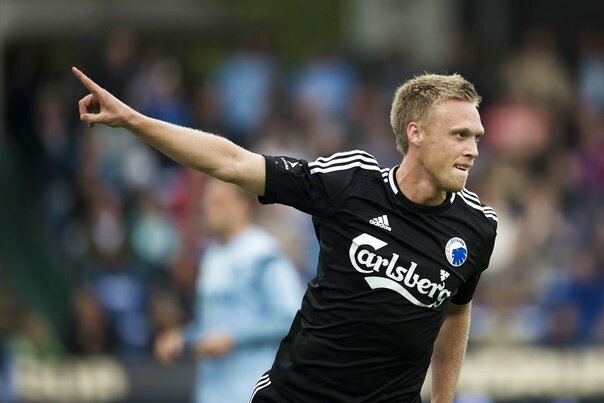 The 27-year-old Jørgensen began his footballing journey in his homeland of Denmark as a left-winger and stayed in that position for the majority of his career. After exciting crowds, cutting inside and striding past defences during his youth career at Akademisk Boldklub, he earned a transfer to the bright lights of the Bundesliga at just aged 19 with Bayer Leverkusen. It proved to be a big step, too early as he struggled to win a starting berth in the first team and moved out on loan unsuccessfully to Kaiserslautern until returning to Denmark with FC Copenhagen. Due to his 6ft 3inch height, he was moved into a target man role before heading to Rotterdam in June 2016 for €3.5m from Copenhagen where his presence really took them to greatness. The Løverne clinching the Danish league title two times and runner-up twice in his five years at the club. He notched a total of 51 times in 137 appearances in all competitions. He continued his trophy collecting inside just nine months in Holland, claiming the Eredivisie Golden Boot with the aforementioned 21 strikes, helping Feyenoord on their way to their first Eredivisie shield since 1999. Now, Newcastle United have yet to win a major trophy since 1969, I’m not saying he can work a miracle to make them title contenders however he can add a lot to the team. But please don’t expect a prolific goalscorer, though he could encourage others to help fill that void. Last season, even though he owns a towering frame, Jørgensen did not score a header, not a bad thing though as playing along with Feyenoord’s short passing football game, he displayed a great poacher’s instinct with fantastic reaction and composed, cool finishing. He possesses decent speed, great technical ability with superb passing range and link-up play. During the championship winning season in Rotterdam last year, along with notching the 21 goals – he layed on 11 assists. His power allows him to hold a ball up and torture weaker defenders and if you have fast wingers on the counter attack, a chance is likely to be created. After speaking to many that know all about the Danish game when playing internationally under Åge Hareide’s Denmark, Jørgensen has become an asset. After the years of possession football under Morten Olsen, Hareide changed the Danes attacking methods to a direct, physical style over the past six months and saw great results. Again, Jørgensen was a real key in this success. He showed he can provide an aerial threat, providing knock-ons for the vertical runs of speedster Pione Sisto from the wings. Although we have to be realistic here and realise the Eredivisie is a massive gulf in class to England’s Premier League, he does seem an ideal signing at this time for Rafa Benitez’s Newcastle. A side that lacks the domineering presence in the air to give them a Plan B in troubled times. He gives you an opportunity to complement a direct approach and win headers in the 18 yard box when you really need that goal. He is someone who will be on the line, on the penalty spot ready to poke home, something that has really hampered the Toon’s season so far – missing that finisher. He has proven at a lower level (Danish and Dutch leagues) to be a capable goalscorer, but in my opinion as I’ve stated, I feel he offers much, much more than that. Can he be the asset on Tyneside that he proved to be in Copenhagen and Rotterdam? Only time will tell… but the Geordies and especially owner Mike Ashley will have to get the chequebook dusted off first.